-Our lifetime warranty film is MaxJet High Performance: Our high performance line is all about keeping cool and looking cool. Made with a metallized layer, Maxpro MaxJet High Performance rejects and reflects more solar energy, is available in darker VLTs, and has an attractive – and slightly reflective appearance. Backed with a manufacturer lifetime warranty that includes color change and fading. -Maxcool IR: A nano ceramic window film that provides higher heat rejection and infrared rejection (IR) than standard dyed or metalized window film. MaxCool IR is engineered to keep the car feeling cooler due to a high rejection of total solar energy and protect the interior from UVA and UVB rays. Backed with a lifetime warranty. 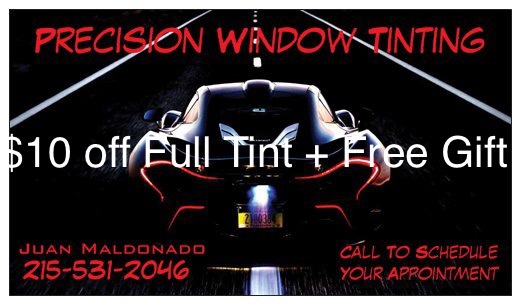 We specialize in automotive, commercial and residential window tinting. One of the main concerns a customer should have when deciding to get their car tinted is what brand of film is being used along with the workmanship of the installer. Here at Precision Window Tinting we use only the highest quality films, MaxPro window films and Lamin-x or luxe for headlights and taillights. We offer a lifetime warranty on all of our work which includes peeling, bubbling, fading, de-lamination and adhesive failure. Along with tinting we also install paint protection and vinyl graphics.